Child ViSion Glasses has won the inaugural Visitor Vote for the Design Museum’s Designs of the Year 2013. Child ViSion Glasses is a revolutionary fluid-filled lens that allows children to self-adjust their glasses. This is the first time the public has been invited to vote for their Design of the Year. Olympic Cauldron and GOV.UK, to be named the publics favourite. a revolutionary website combining all of the UK’s government websites under one single domain. and third respectively in the vote. Child ViSion and all of the 99 nominations are on display at the Design Museum until Sunday 7 July. 1. 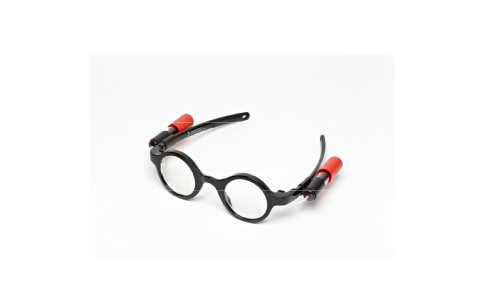 CHILD VISION GLASSES – Designed by The Centre for Vision in the Developing World and Goodwin Hartshorn Self-adjustable glasses that allow the wearer to tweak the lenses until they can see clearly. Child Vision glasses have been developed specifically for use by young adults aged from 12-18. 2. 3D PRINTED EXOSKELETON ‘MAGIC ARMS’ – Designed by Nemours/Alfred I. duPont Hospital for Children in Wilmington, Delaware The duPont Hospital for Children treats children suffering with musculoskeletal disabilities and as part of their research, duPont’s Department of Orthopedics developed WREX–the Wilmington Robotic The Designs of the Year Visitor Vote Exoskeleton. It gives teenagers with muscle weakness better movement and the ability to lift objects but the exoskeleton was too heavy to use on a smaller child. They figured out that by 3D printing a wearable plastic jacket it would offer the same aid as WREX but in a mobile form that a child weighing only 25 pounds could wear and would allow them to reprint jackets at a cheaper cost as the child grows. LiquiGlide is a ‘super-slippery’, non-toxic, edible but tasteless substance that can be applied to the inside of a bottle, preventing the condiments from sticking to the neck and the bottom where they can’t be reached.